"The star is a symbol of the heavens and the divine goal to which man has aspired from time immemorial; the stripe is symbolic of the rays of light emanating from the sun." 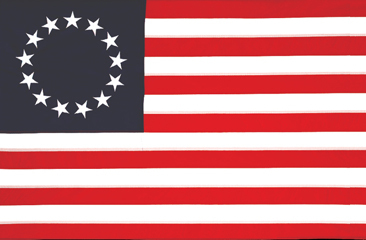 Alternating in red and white, the 13 stripes also represent the 13 original colonies that joined together to declare their independence from Britain in order to establish themselves as a sovereign nation. "The colors of the pales (the vertical stripes) are those used in the flag of the United States of America; White signifies purity and innocence, Red, hardiness & valour, and Blue, the color of the Chief (the broad band above the stripes) signifies vigilance, perseverance & justice." More information on the Symbolism of the American Flag can be found here.